This exquisite Syrah, comes from our best organic vineyard. 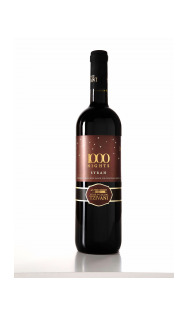 Oak aged for 12 months, with a deep purple colour and intense aromas of spices, vanilla and black fruits. A rich taste and long finish. Enjoy at 16 - 18o C with red and wild meat dishes, strong cheesesand bitter chocolate sweets for an intense flavor sensation. Recommended for ageing.